Tactics for planning and saving on family travel. A family vacation can seem daunting, but it doesn’t have to be. With a little planning, you can save money and ensure that everyone, including you, has a great time while traveling. Preparation is the key to success for a getaway with children. There aren’t many places on this planet that I wouldn’t visit with my kids. However, when we go, how we get there, where we stay and what we do upon arrival depend on a variety of factors ranging from the ages of my children at the time of travel to our interests. Considering these sorts of variables when researching and deciding on your itinerary goes a long way in making your trip problem free. Well before you hit the open road, calculate how much gas costs will be. You can use AAA’s gas calculator and then compare it to bus, train and airfares. You may find it cheaper to fly to your destination. Airfarewatchdog.com is a wonderful site to monitor for flight deals and sales. You can have e-mail alerts sent to you for a specific destination or from an origination city. Also, be sure to follow relevant airlines on Twitter and Facebook, where exclusive discounts and deals are often posted. Insiders know to look for the best airfares on Tuesdays and Wednesdays. On these days most airlines offer the biggest deals with prices rising throughout the course of the week. When you are ready to book a flight, arrange your schedule to travel on Tuesdays, Wednesdays and Saturdays, if possible, for optimum pricing. You can save considerably on your expenses when traveling during the off or shoulder seasons. For instance, Europe’s high season lasts from May through September. Head to London in October and you’ll enjoy fewer crowds, comfortable temperatures and cheaper airline ticket prices. The Caribbean and Mexico have lovely weather in late April and May. But prices for flights drop during these months as they fall after spring break and before summer vacation. Wherever you’re headed, remember that car seats do not count as checked luggage on any airline. Get yourself a durable car seat cover and check it through to your destination. You will not be charged. Money saving packing tip: When your suitcase is more than 50 pounds, avoid the overweight bag fees from the airline and stick some of those extra clothes in the car seat bag. Selecting a hotel for your family? An all-suites hotel makes for a comfortable and cost-effective stay (think Embassy Suites or Spring Hill Suites) because it includes a separate living area and kitchenette from the bedroom. Most all-suites hotels also provide free breakfast. When traveling with infants and small kids who need naps or earlier bedtimes, it’s nice to be able to put the children to bed, close the door and have grown-up time in the living room. If you are planning an extended vacation beyond four or five days, then finding a furnished condo, home or apartment might be wise. A site like Hotels.com is an ideal place to begin looking for the best fit for your family. Not only does it sort by price, the site offers almost every type of accommodation imaginable, from stays at private homes and bed and breakfasts to family resorts. Look for promotional savings, such as “stay two nights, get a third night free” or “save 30 percent on your stay.” Plus take advantage of resort credits that can be used in the restaurants and stores at a particular hotel. Today, many hotels get it. The “it” being that family friendly equals repeat business and lots of it. Some hotels go well beyond children’s menus and in-room refrigerators with kid suites complete with bunk beds and pint-size furniture. Here are a few hotel chains that stand out in the world of family accommodations. Loews Hotels: Loews calls its award-winning family travel program Loews Loves Kids. Each of the chain’s 18 hotels and resorts in North America has a lending closet stocked with family travel necessities including games, books, car seats, strollers, hula hoops, night lights, potty seats and baby bath tubs. Desire a childproofing kit or an age-appropriate welcome gift? Just ask. Kimpton Boutique Hotels: Kimpton’s boutique hotels are home to some of the greatest hotel experiences for parents and children. The KimptonKids program makes it a cinch for families to travel by having the items parents tend to dislike packing like safety kits. You’ll love the small animal print robes that fit junior guests. And if your kids are of the four-legged variety, Kimpton will cater to your pets. Hyatt Resorts: Hyatt Resorts offer kids their own vacations with the Camp Hyatt programs found at resorts in the United States, Hawaii and the Caribbean. Camp Hyatt has teamed up with National Geographic Kids to feature new adventures loaded with eco-friendly activities, animal crafts and facts, photo safaris and tons of locally inspired activities. Single parent travel tip: All-inclusive resorts in the Caribbean and Mexico are often priced for double occupancy. But now many resorts are offering discounts for single parents. For example, Breezes all-inclusive resorts have single parent months from August through October. Getting the whole family involved in planning vacation activities reduces conflict later. Once you have chosen a vacation destination, build excitement and anticipation among your kids by learning together about the area. By allowing each member of the family, no matter how young, to choose something for the entire clan to do— even if it’s as simple as selecting a particular restaurant for dinner— you give each person a stake in the trip’s success. It’s a perfect way to turn an apathetic teenager into an eager participant and to help a younger traveler understand that everyone gets to have a great time. Also once you have decided on a vacation place, sign up for local city deals through the online visitor’s center and on sites such as Groupon and Living Social. You’ll score big savings on area attractions, dining and entertainment. Keep in mind where kids eat free and split meals. This can bring a family of four or larger enormous savings. Restaurants that are kid friendly are happy to accommodate special requests for extra plates. And many restaurants offer free meals for kids with the purchase of an adult meal on different days of the week. Another tip is to bring your own stroller. If you’re going to visit theme parks, then this can save you $7 to $30 (for a double stroller) per day in rental fees. Bring along individual refillable water bottles, too. These can be refilled at the hotel and at restaurants around your destination. A family of four could easily spend $20 or more a day just buying water. Family fun travel tip: Tote along a few silly trip prizes to award on family dinner nights. 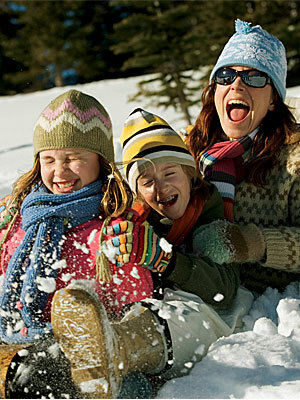 Giving your family the gift of travel gives loved ones memories for a lifetime, especially when vacations go smoothly. Part of creating a successful vacation experience is feeling like it is worth the time and expense. By planning ahead and understanding certain costs, you can budget for the unexpected surprises along the way. Nicole Hockin writes for www.travelsmartblog.com, which provides practical travel advice and deals courtesy of Hotels.com. She is a regularly featured travel expert in print, on TV and on radio including on the Rachael Ray Show, The Daily Buzz and numerous others.